Photo: Erich Haber, Wisconsin DNR. Drawing: R. Scribailo, Purdue University. European frog-bit is a free-floating plant with clustered heart-shaped leaves. New growth sprouts from trailing runners, or stolons, and from turions, buds that lie dormant during the winter months. White flowers with three petals and yellow centers bloom in the summer. European Frog-bit is native to Europe. 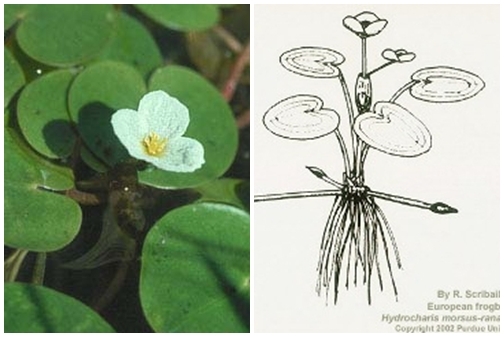 It was introduced to North America in the 1930s as an ornamental pond plant. It grows in dense mats that block light to native plants. As they decay these mats deplete oxygen needed by fish. They also impede recreational water activities like swimming, boating and fishing. European frog-bit has been reported in Vermont, New York and several Canadian provinces.